We’ve supported plenty of teams over the last few years. Of course that’s where we started from – hence the name. We wanted the focus of a sports team to be on the playing ( you know – the fun part ) – not the administering – the management of the team. So we made the team manager’s life easier by helping them see who’s coming. We made the player’s life easier through reminders and easy access to where the game is right now. We made parent’s lives easier through a single view of the weekend ( BTW, mine right now is 7 games over Friday to Sunday. Eeeek! ) And we made coach’s lives easier by giving them planning and training tools. But in 2016 something really interesting is happening – the best clubs, the biggest clubs are moving to the Teamstuff platform. We’ve taken the same focus on saving time at the team level to the club, so a club that’s using Teamstuff gets beautiful well organised teams as well as a beautiful well organised club. And what’s really really interesting ( for us definitely, and maybe for your club too ) is that it’s the biggest clubs, with the biggest administration issues that are getting on board. And we think that’s because we’re reducing the load on the club administrators, and our clubs.teamstuff.com offering is delivering the clubs what they actually need. Which is a really motivating result for us, because we have long believed that the tools we make have to actually work ( solve a problem / save people’s time ) rather than just looking like they’re working. Really, this is the age old ‘function’ vs ‘marketing’ battle, and it seems that actually being useful is beating the ‘but it comes in your team colors’ brigade. With over 1,200 players the Ashburton United Soccer Club in Melbourne, Australia has plenty of logistical challenges. How to communicate with all their players and parents. How to maximise sponsorship dollars, or how to organise the many U10 teams. With the club this big, it’s imperative that it has access to tools that support gllefficient management. And so the club choose the Teamstuff platform years ago, and remains today one of our biggest clubs. But it’s not the biggest. Because if size matters, then maybe we should look north – to the largest community football club in Australia. 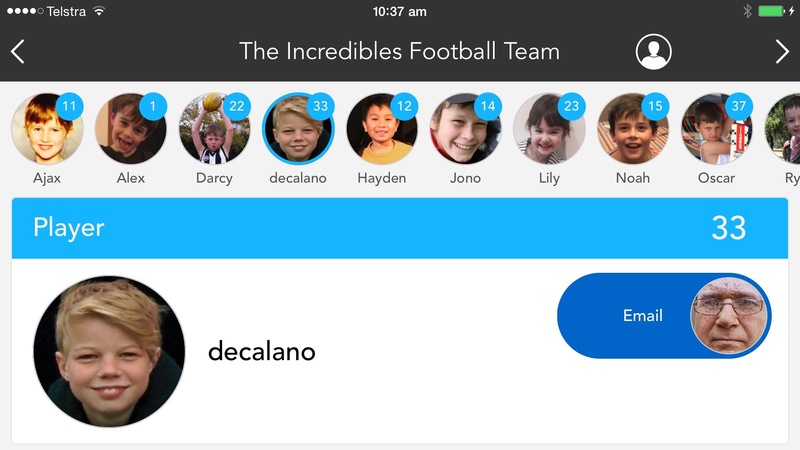 Closing on 2,600 players this year, the Balmain & District Football Club has moved away from a time consuming team app ( that comes in the club colors, but doesn’t really do a lot ) to our platform. And that decision was all about productivity, all about features, all about the problems Teamstuff can solve. There’s another new addition closer to home, where Glen Eira Football club has a clear vision to be the best run club in Melbourne. And if doubling in size in the last few years is any indication, they seem to be on the right track. Not only are they doubling in size, they’re also pushing us hard to add new capabilities to help clubs grow, organise and support their sport and their family. And so the cycle continues. The more clubs we have, the more we get pushed to have more capabilities, the more clubs come on board. It’s lucky we love building things, and it’s lucky we’re never satisfied with what we have today. So our 2016 is shaping up nicely, with the best clubs – the biggest clubs- powered by teamstuff. Shouldn’t yours be too? This entry was posted in General Stuff on February 24, 2016 by Coach. 2015 – Where did you go? Is that how you see the year too? It’s such an overused cliche ( is there any other kind? ) but for us here at teamstuff, it’s exactly how it feels. So I’ve been planning this review for about 2 months now, and suddenly I’m buying last minute presents for the kids writing last minute letters to Santa. At the start of the year, we wrote a piece detailing our goals for the year. It felt like a big year of change for teamstuff – so that’s a great place to start for reviewing 2015. So taking each area in turn, let’s see how we went. The aim was to get edit onto the mobile platform in the same way it appears on the web platform. I think we’ve done pretty well on this goal. Teams, games, training sessions all editable on the mobile platform now. The latest release ( as of last week ) has beautiful account settings editable on mobile, so we’ve carried that goal right through. So we’ll give ourselves a B+ on that one. Yep, we have that well supported this year. US, Australia, Canada, Germany and the UK all have text message support. We use twilio as our text messaging partner, and their tools and integration have been super solid. Rating A. Made some big strides ahead here. We released a ‘know your team’ killer feature in the middle of the year, and it was the start of a thirst to make the user experience as great as it can be. If you look at the payments and the user experience there, you can see where we are headed. And – we’re redesigning all the older parts of the application and web as we speak. So this year the web teamstuff.com started looking a bit more like the apps do! I’d give us a B ( on the right track, more to do ). Which we did actually achieve! We have a beautiful interface for managing the team based payments – either in cash or direct to bank accounts via stripe. Only been out for a month but the feedback on this has been astounding. As has the tens of thousands of dollars that have already gone through it. We’ll give ourselves an A here, but we might mention that we’re already looking at how we roll this up for clubs for example. Really powerful. We’ve got lots more languages this year, with steady growth the usage of our languages. Germany – very popular! We think we could have achieved more with those languages – let’s call that one a B. Not so good here. The bright shiny thing called ‘what cool feature can we build next’ just keeps getting in our way and preventing us from telling people what a great choice we are. Closing in on feature complete with teamsnap – just better and cheaper. Maybe we should tell a few people? We did try a few new things this year, let’s call it a D.
Another epic fail here. Once again, a big fat F. Sorry everyone – we just forgot to add in paid plans in 2015. Oh well, we’ll add that to the To Do list for 2016 shall we? We’ve maintained a beautiful J curve for growth – all without marketing. It seems that people who use teamstuff seem to like it, and tell their friends. That’s a good thing right? We added in Duties ( things you need to do for your team ) as a first order, in your face item for all team members. Pretty much impossible to ignore. We got duty volunteering onto the mobile with a nice to use interface, and finally delivered duty xfer from player to player – all without involvement from the manager. Nice update. Oh, we just redeveloped our clubs offering – clubs.teamstuff.com. And we’ve got a few features in development under the clubs banner – out early next year. We had one outage for the year – less than 16 minutes. And in true 2015 fashion, our users notified us via twitter at about the same time as our alarms were going off. OK, I’m going to be generous, and group together the areas we promised to you, our users. We delivered 4/5 of the initiatives we targeted, and delivered a few others on top of that. OK, let’s call that a B+. We aren’t satisfied yet with the platform, and we’ve got more features to build, and more UX to improve. But the platform today is way better than at the start of the year. B+. If we group together the initiatives for teamstuff – marketing and revenue. Oh gosh. Not great. I think that’s an F. Guess we know what summer school I’m going on then! We’ve built a great team here in Melbourne, and we love what we do. Building software that makes a difference to thousands of users – it’s a total joy. Coming to work energised, going home happy – that’s a rare privilege. We’ve all got summer breaks coming up, and we’ll be coming back to work in 2016 pretty fired up. Massive year coming up. Oh – and that little boy reading ‘The Bears Holiday’ or ‘Sniff-Snuff-Snap’ on my knee? A year later and he’s currently reading Harry Potter ; book 5 I think he’s on now. All things change – and isn’t that wonderful? Lastly from the Teamstuff family to yours – have a safe, healthy and wonderful end of year break. This entry was posted in General Stuff on December 22, 2015 by Coach. Did you get that reference? I suspect I’m showing my age in this post – it’s Jerry Maguire ( 1996? ) and that’s a pretty famous line. But equally – if you recognise it – then maybe you’re showing yours! 😉 Anyway, we finally kicked into production a feature that’s been on the board ever since we started. Payments. Asking for them – getting paid, making the payment. I know; sweet! This is a big one, since every team I’ve ever played in has cash in there somewhere – court fees, season fees, uniforms or transportation. Paying for the umpires or the insurance. There’s always something that needs to be paid, and it’s normally just another job for the team manager. You know – the unsung hero wandering around the player and parent group – coughing politely – “Have you paid the registration fees yet? “, keeping records, reminding people – and very often – coming up short. 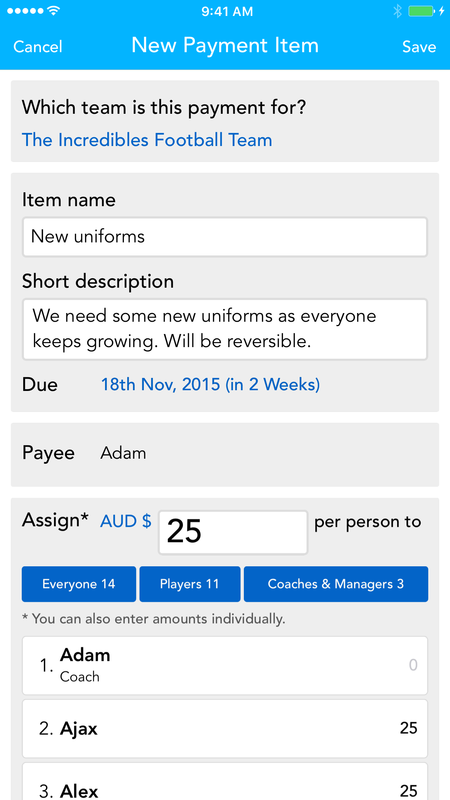 If you’re the team manager or coach, it’s never been easier to collect money for your team. Choose the team, and describe what it’s for. Tell your team when it’s due, and how much it’s for. We’ve made it super easy to add amount to your team. In the example below, I have added $25 to all the players. And that’s taken me all of one click – on the Players button in blue under the $25. Most of the time, most people will owe the same amount – so we’ve made that super easy. But of course we know that not all team payments are the same – so you can edit any person to any value you need. In fact, you could have a different amount on every team member if you need to. No problems, we’re here to support. OK, once your numbers are good – hit save, and magic happens. We’ll send out notifications to your team members ( push / text or emails ); letting them know what they owe, what it’s for and when it’s due. So that’s the easy part. The hard part as always is getting paid. Hit the big green ‘receive a cash payment’ button. Those steps look a little like below – where I’m recording receiving $20 for player Sam. And of course you have a full audit trail of who’s paid, and what’s outstanding. Wouldn’t it be terrific if we could get paid directly into our bank accounts? No cash to lose ( or spend! ) – and super convenient for all. Well teamstuff ( and our partners at stripe.com ) have combined to make this happen. For the manager wanting online payments, you just connect your stripe.com account ( free, easy to create and use – available pretty much everywhere we are. super secure). 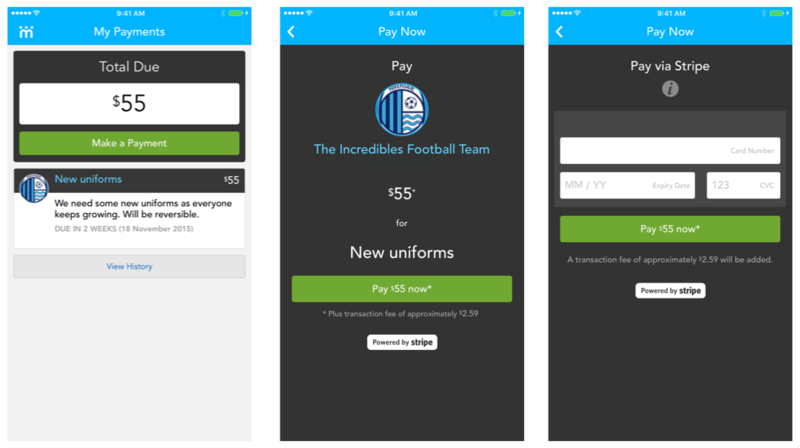 So – your team members can now pay online, using the Teamstuff app on their iOS or Android devices with their credit card. First thing they’ll see in their app is the payments section calling out to them with a ‘new’ payment ready for them to pay. Next – your team members will see all the details they need – what they owe, what it’s for and when its due. Together with a very large ‘make a payment’ button. And that’s it. 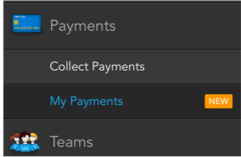 The full lifecycle of payments is now handled in teamstuff. You might find a few extra features in there too – say the ability to easily remind those yet to pay. Payments done the Teamstuff way – totally handled. 100%. Or in the words of my thirteen year old – “Legit”. Which I believe means good/ true / authentic / the dog really did eat my homework. Stripe does all the hard work. Next – Stripe does all the hard work. Finally – Stripe does all the hard work. If you got to this paragraph – well done you! That’s an enormous amount of technical detail to absorb. But it’s no accident – we want them to do all the hard work, all the fraud detection, credit card processing, moving money between accounts. And that’s what they do, and do superbly. Here at teamstuff, we want to focus on your team, so by using stripe we can leverage what they’re great at, and avoid the problems that often come with financial transactions. We store no credit card details ( ever ), and we do nothing with the monetary transfers. We simply ask the experts in the field to help us out – stripe.com that is. And that’s what they do – for a small fee of course. You might notice that if you pay online, the team member making the payment will be charged a transaction fee. Part of that covers stripe’s fees, and part of that goes to us – to teamstuff. Finally – we have some form of revenue. We’ll try to keep the rest of teamstuff free for as long as we can. In the meantime, use the payments feature how you want to. Some will pay in cash and there’s no transaction fees at all. Some will pay online for convenience, and we’ll get a small cut. Now, wonder what our next big feature should be…..
p.s. So it’s about 2 days since we’ve gone live, and we’ve got some outstanding feedback to date. Clearly our most well received feature – ever. But the pick of the bunch so far has to be this response from Josie, Baldwin City, KS. No complaints on my end on the fees you are charging. Your app has been so valuable to our soccer club. We did some research before choosing to use it, and all other options were very expensive whereas your app was free. You guys definitely deserve some compensation at this point! And this is the perfect way to go about getting it. If parents don’t want to pay the fee, that’s fine, they can continue to mail me a check. If parents prefer convenience, they can choose to pay the fee and pay through the app. That way everybody is happy. We have around 200 players and we don’t currently accept credit cards because of the fees. We don’t want to have to increase our dues to accommodate the people that want to pay by credit card. This way, we won’t have to do that. We can accept credit cards, and only those people who want to pay that way will absorb that cost. Plus I have less work to do! Plus everyone knows their balance at all times! This entry was posted in General Stuff on November 5, 2015 by Coach. 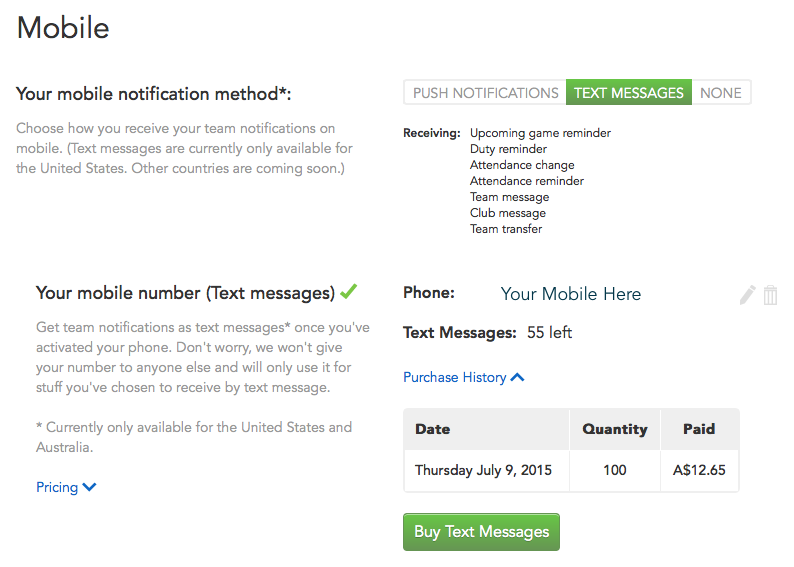 We ticked off another one of our ‘big ticket’ items the other day – adding support for text messaging into teamstuff. So that we’re clear, we’re talking about the ability for teamstuff to notify you via a text message straight to your phone. So when the coach cancels training – you get a text message – rather than a push notification or email. There’s probably two key benefits to go for text messaging as your preferred communications style. There’s also one big downside for teamstuff – they cost us real money – per text message. So we’ve introduced text messages as a paid feature – in fact our first paid feature. So the idea is that if you the user ( not the team, not the club ) would prefer text messages, then you buy a ‘bundle’ of messages. We still think that there’s a place for push notifications and for emails – but if it’s your preference to get text messages, well we now support that too. No problems! Take a look into your Account Settings on the web. Just jump online, and find your Account Settings. From here, you can choose to get Text Messages rather than Push Notifications. To do this, you’ll then need to register your mobile – and verify it’s yours. Like Google – we’ll send you a random code to your mobile to prove it’s you. Now that you’ve registered yourself, you’ll need to buy a bundle of text messages. Now the cost of these varies by country – for me here in Australia they are relatively expensive. The effective price you pay varies too based on how many you buy, but to give an indication they vary from 2c to 3c per text in the US, and from 10 to 13c per text in Australia. Just in case you’re interested – we are using stripe.com as the payments provider. Many reasons why ( including easy ability for us to integrate into ) , but one of the best reasons is security. Teamstuff never deals with credit cards – stripe does all that hard work. Once a transaction is successful – they’ll let us know and you get your bundle of text messages. OK – after that – you might want to look at your Notification Settings. These let you personalise what you receive from us and how you receive it. Allowing you lots of choice about when and how you might be notified. 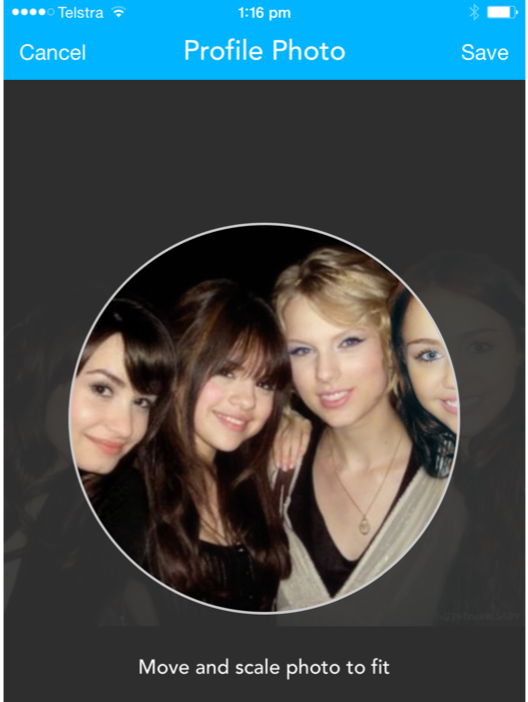 And the end result – the teamstuff central servers start talking to your phone directly using text messages. Note : We support the US and Australia for text messages at the moment. More coming soon. Why Can’t You Use Your Own Text Account? Most all people with mobiles can send text messages – and very often it’s a lot cheaper than what we pay for. So we’re frequently asked whether we can integrate from your own account. And the very clear and simple answer is no – it’s not possible. The text messages we send come from the teamstuff servers ( for example, when sending a reminder text message for a duty ) – not from your phone – so we pay integration partners ( such as twilio amongst others). We have no ability to send a text message spontaneously from your phone, or your account. This entry was posted in New Stuff on August 15, 2015 by Coach. How many teams are you a part of? How many new players and new parents are you suddenly spending a large portion of your weekend with? One of the challenges of teams sport is trying to remember everyone – both who they are and which player belongs to which parent. Teamstuff now has you sorted. How? Just go landscape. When you are next at the game or training – jump onto the app, and go into landscape mode. That is – just turn your phone 90 degrees. Boom! Some magic happens here and you’ll see your team in a whole new way. 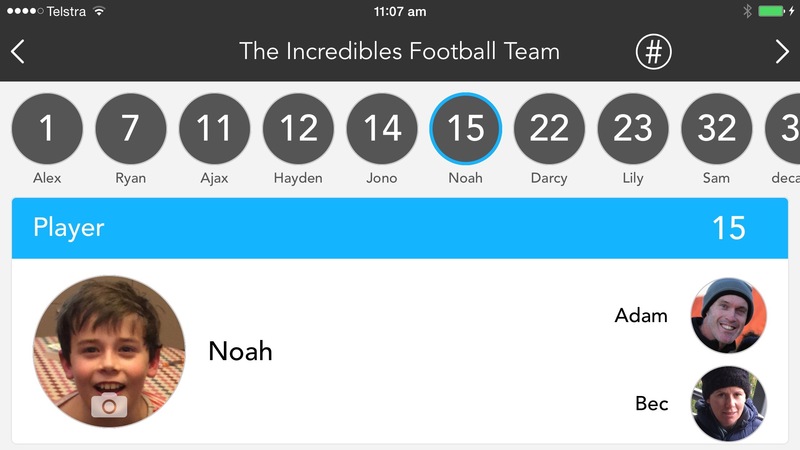 Here’s my “Incredibles Football Team” in all their glory. So straight away – you can see all the players – beautiful hi-res photos with names and numbers. Sweet! But what if you have lots of players – well that top panel is scrollable left and right. So just slide it anywhere you need. To get more details on a player – touch their profile at top. Down below you’ll see some more details, including parents if this is a kids team. But what if you don’t know them yet by name? What if you just watched number 15 make a saving kick out of defence? Got that handled too. Touch the person icon on the top bar – and it shows some display choices. Now you can show by player numbers, and suddenly it turns out that the brave player who cleared the ball is actually Noah! “Great kick Noah” sounds a whole lot better than “Great kick number 15 whoever you are” now doesn’t it? 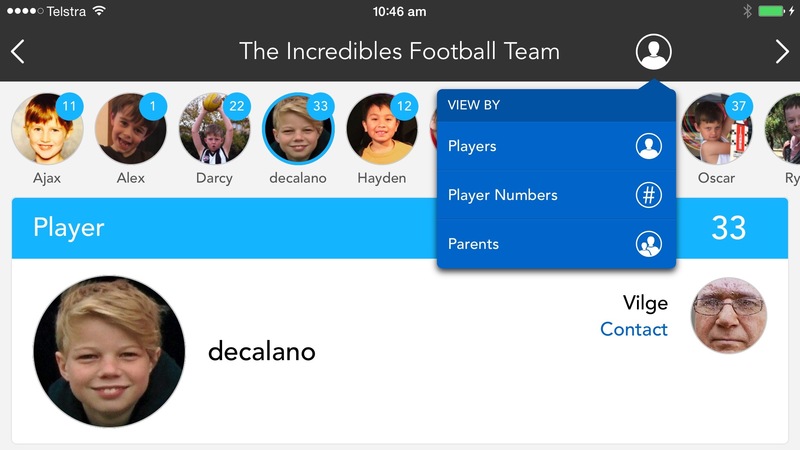 You can also sort by the parents on the team – a great way to quickly put those faces to names. There’s plenty of times when you’ll want to contact other players or parents in your team. And the team display has this covered. 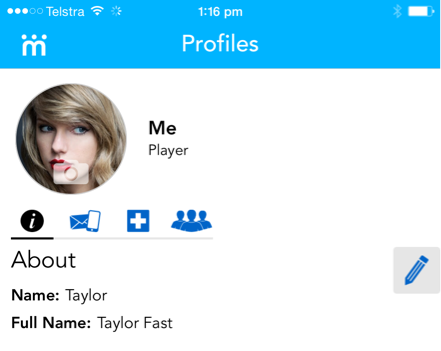 Just find the player or parent – and touch on their photo on the player card. Suddenly you’ll see something like the following. In the example above, Vigle is Decalano’s dad – and he’s only listed his email in teamstuff – so that’s the only choice you have. But if he had his mobile you’d see other choices there too – such as texting or calling. Note of course that we respect your privacy choices – so the amount of contact information seen here is of course very much under your control. The last trick here to make your life easier – is that coaches and managers have the ability to set the players team number and their photo directly from the player card. Just touch the number to update it – couldn’t be any easier. 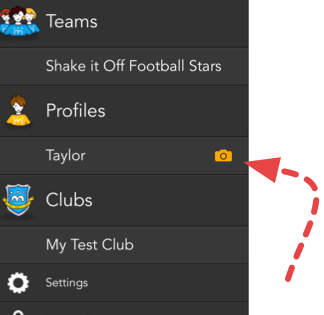 For player photos – coaches and managers can only update the players profile photos if none have been provided by the player or parent. It’s a great way to get the team setup on the first training – and let parents and players improve from there should they want to. We’ve already had some fantastic feedback on this feature – and we hope you love using it as much as we loved making this little beauty. In some more detail – one of those successful clubs is South Melbourne Districts Junior Football Club here in Melbourne. I asked James Ramsden, their self-appointed Teamstuff Ambassador what worked – and what didn’t, and how they solved those issues. I’m a big fan of Teamstuff – I’ve used it for the team I manage for a couple of years – and this helped us as a club decide to implement it across all teams. But being a big fan doesn’t automatically mean the roll out to the club will be all plain sailing. Here are a couple of tips that will help iron out the bumps and you’ll be up in no time. First of all it’s got to be a club decision to go with Teamstuff. The committee is the power – they have to say yes and you’re guaranteed of success (even though you’ll hit a few speed humps along the way). Secondly, some people will resist using Teamstuff. They’ve got their own way of communicating – whether it be pigeons or sending 4 million emails – you’re dealing with entrenched habits. One of our problems during the roll out to the club was Team Managers ( TMs ) not been strong enough with parents to say NO I will not communicate via e-mail, SMS – it is Teamstuff or nothing. We now say, “If you do not use Teamstuff your son/daughter will not be selected in the team as this is how we manage team lists”. This threat was enough to get people on board. A big push for us at South Melb Districts Junior next season is to ram that message home to coaches, TMs, parents and players. Understanding what’s behind this resistance is important – people don’t like change. Getting them to use Teamstuff is the key – be strong that it’s the only way and that will help them get over the biggest issue which is not knowing how it works. I found that just by doing it, you work it out. I encourage any team or club to get started. One big challenge is when you move to squads – e.g. U13 – 2 teams operating as a squad. 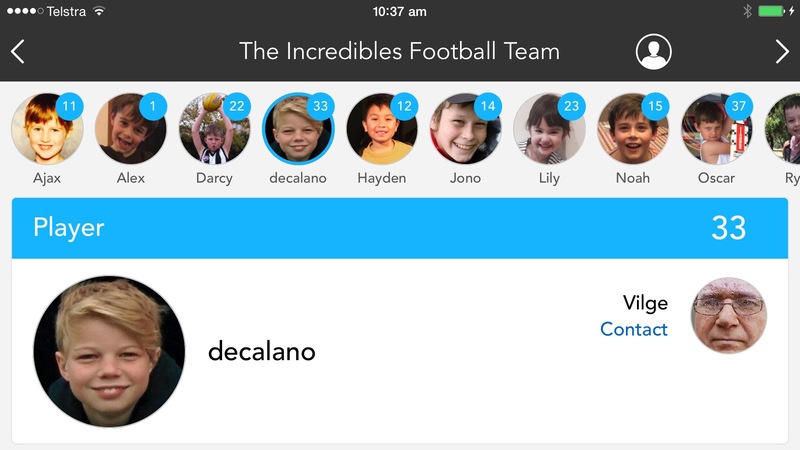 You have kids who will sit in both teams and will be rostered on/off during the season from one team to the other – with collaboration and hopeful improvements to Teamstuff for rostering on/off it allows clubs and teams to communicate to parents no matter what team they sit in from one week to the other. It’s a challenge every week in the older age groups with player availability, illness, injury, league player movement policy, etc. Teamstuff for clubs – an awesome platform to communicate important information/messages – brilliant that you can include sponsors on comms. I’m a big fan of Teamstuff because it makes it easier for me (as TM) but also because the parents love it (our teams are junior football and basketball). When the parents love it, you know roll out is going to work. Rolling out into the teams, I made myself available (as the go to person for Teamstuff issues) to all tm’s for questions. I started a group email (we set up a Teamstuff email for tm’s) so everyone could see and learn from questions that came up. We started a few weeks before games began and by the first game, everyone was on board. The benefits of the club version have been the ease with which club officials can communicate with all teams – and the overwhelming positive feedback from parents! Now the season’s almost over, we don’t hear any more complaints about having to use Teamstuff, every team is on board and so is every player. And all’s quiet – and we can focus on the game! Now that’s impressive! I’ve seen a lot of clubs rolling it out – and here’s my summary of the best practice tips to guarantee your club and your teams get all the benefits. Have the authority to rollout to the club. Once the club hierarchy understands how the club, all the team managers and all the parents will benefit – it’s usually plain sailing from there. Communicate with your teams and clubs. People like understanding why they should change from “carrier pigeons” to teamstuff. Bring them on the journey – most will see why. Share Your Ideas. James setup a group for easy communication of how best to use teamstuff. Great idea for your club – just like you’d share best coaching tips – it’s the same with the boring administration and communications. Have a Teamstuff Ambassador – someone who can front line most of the club’s first questions. In this case it was James – having one person who can help people through that first change – another great way to speed up the rollout. By seeing common questions specific to your club – and knowing what your club is trying to achieve means solutions can be found in the shortest possible time. There you go – 5 best practice tips to make your club rollout as easy as possible. And lastly – big thanks to James for sharing his experiences rolling out to the entire club. It’s always nice to hear how it’s working for real people – real clubs. At the end of the day – that’s what we’re building that software for! This entry was posted in General Stuff and tagged club on August 9, 2015 by Coach. Teamstuff has some big plans for the next few months. Payments, files and photos, text messaging and a big UX upgrade. But in between all the huge stuff, we like to sneak in some smaller changes. Sometimes because they’re small and important, sometimes because they’re small and fun, sometimes because they’re both. This one could just fit both categories. So let’s go through a couple of things. One thing – cameras on the modern phones are unbelievably good. ( I’m a bit of a photo nerd so feel qualified to make that call! ) So are the screen resolutions, and in both there’s a massive change since we launched 3 years ago. So moving to a higher resolution is a no brainer – we’re just following the real world there. We did a fair bit of soul searching on the process of adding these profile pictures, and realised that we haven’t really made this super easy to tell teamstuff here’s a new photo – nor was it easy enough to get a decent, tightly focussed shot of you, or your child. So we’ve changed both. In this release, the mobile app gives you some pretty clear clues you might want to add a photo. 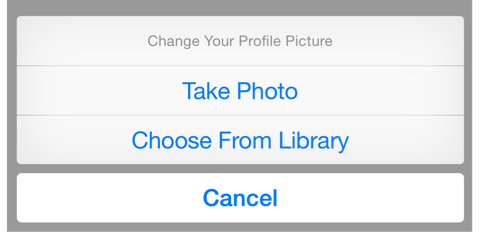 In fact post login on mobile – it’s at most one tap, one swipe, one tap – and you’re updating a photo for your profile. So that’s the first part. The second part is being able to find a decent photo of you/your child – and making sure the most important part – face – is the feature of the profile picture. And we’ve completely redesigned that from the ground up. So you can choose to take a new photo, or use a pre-existing photo from your library. You might be surprised how useful this is – even a family shot can be easily used in the next shots to get a great profile picture. Here’s the choices as you’ll see them. Choices as you would see them on iOS. Similar for Android. Find the shot within your library ( or take a new one straight from the phone ) – and now we present you with some beautiful tools to make sure you use the photo properly. Hit save – you’ll find it at the top right, and you’ve updated your profile pic. It’s super easy – gives a great result. And this is what new profile pictures look like. The new profile picture is a whole lot better than ever – better resolution, far easier to see the details – sitting in a circle ( so 2015 ) – AND for the eagle eyed out there, you might notice we automagically will redo both your hairstyle and your makeup as you save the photo. *not all of this sentence is true. Now – you might be wondering why we’ve done all this work. And it’s not just because we need more Taylor in our lives. Nope – there’s a reason. A really good one. But we’re not telling. 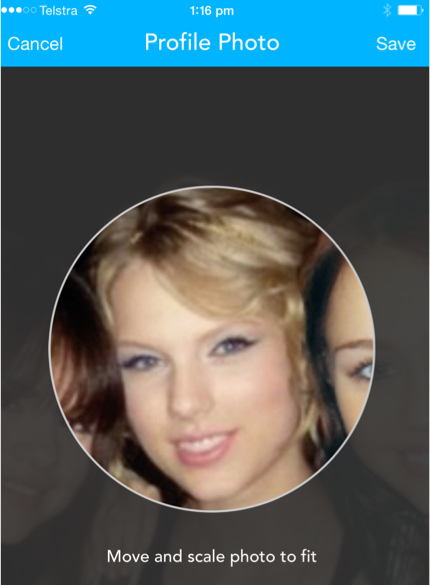 Update your profile pictures, and make sure you get the next mobile release ( couple of weeks ). Because when you get that release, we think you’ll going to love how your team appears in the general landscape that is teamstuff. Go get snapping! This entry was posted in General Stuff on July 16, 2015 by Coach.